The “Oceans” films have always centered on a male heist team buddy-bonding to steal something amazing. 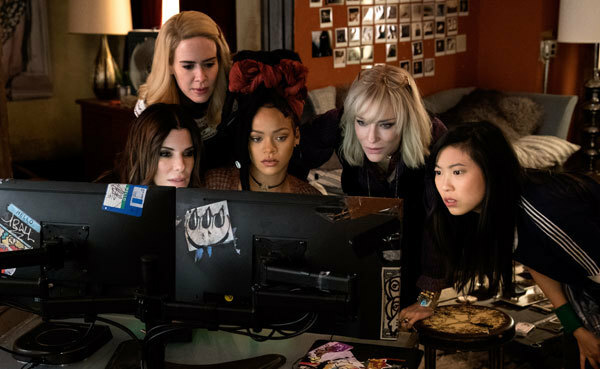 Here comes Ocean’s 8 in which eight amazing, feisty women unite to pull off a giant heist at the glam and famous Met Ball in New York City. 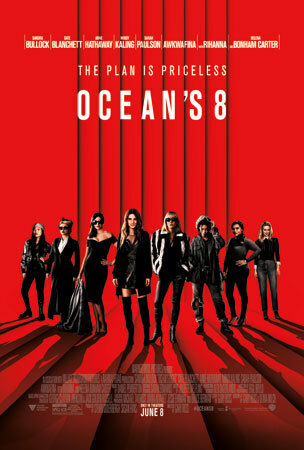 Spearheading the theft is Danny Ocean’s estranged sis Debbie (Sandra Bullock) who assembles her dream team; Daphne (Anne Hathaway), Lou (Cate Blanchette), Amita (Mindy Kaling), Tammy (Sarah Paulson), Constance (Awkwafina), Nine Ball (Rihanna) and Rose (Helena Bonham Carter). Most of the team (Rihanna and Helena couldn’t make it) met in L.A. to talk sisterhood, an all femme workforce, glamming up and more. 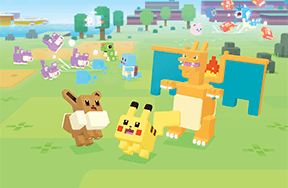 Read all about it here at Kidzworld. 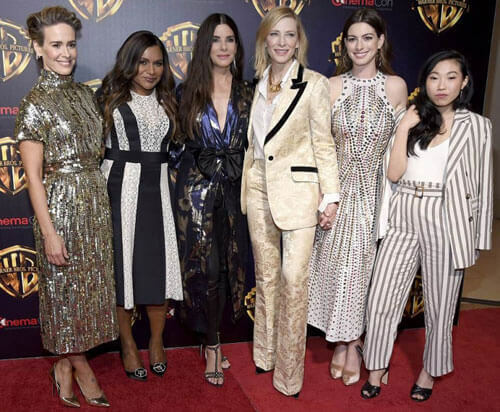 All of the ladies look fab of course and admit there was a chain text flying through the group before the press day regarding who was wearing what. Q: Sandra, you play Debbie, sister of George Clooney’s Ocean’s character Danny in the film. How many hours of phone conversations did you have with George to really delve into the brother/sister relationship? Q: I’m sure. Cate, how did you feel when you first read the script and saw so many scenes with eight fully formed women in them? Cate: Well, you don't read the script cold. You read the script with the legacy of (the Oceans) movies and knowing that Sandy was going to be in it, I could already see the tone. Then of course the first question is, “Well, who are the other ladies going to be?" In the end, to me, it's about the ensemble. Once I knew who the other women were, I just felt like it would be a great, fun thing to do. It's a risk and I thought it was a risk worth taking. Q: Anne, it's so fun to watch you play Daphne because you're sending up the celebrity culture. What was most exciting for you to play with in this character? Anne: It was fun to know that the research was already done, that the muscle memory was in there about what her life was like. I wondered what would have happened if at the beginning of my career if I thought of fame as something that was real, as opposed to maybe the way I do think about it, which is that it's very illusionary. I had a blast. I was just so excited to be in this cast and I was just really thrilled to play with everybody. It is always special when really talented people are given opportunities to do their jobs. Q: Mindy, what about the character of Amita? 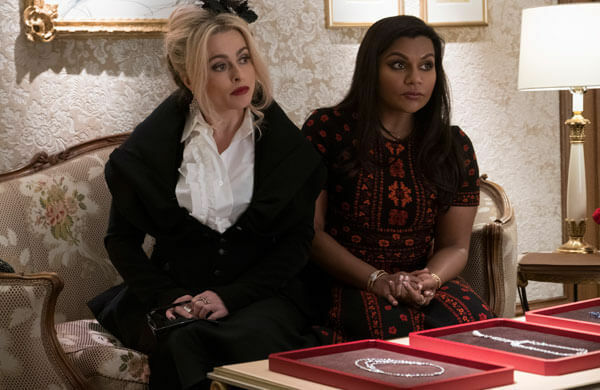 Mindy: This is actually one of the more challenging roles, which I didn't anticipate, because I had this idea that the Ocean's movies were just a breezy hangout where George Clooney plays pranks on everyone. This was very challenging for me because I had to learn Hindi for a scene I had. I had to have a fight with my mother in Hindi. I wasn’t raised speaking the Hindu language. Q: Sarah, it's super fun to see your twist on the suburban mom character of Tammy. Was that fun to play? Sarah: Oh yeah. I myself am not a mother, so it was a stretch in and of itself. I thought it was interesting that she had all those microwaves and blenders in her garage. She used to very much be immersed in (the crime lifestyle) and she’s (pulled back in) 'cause private school's expensive. Those kids gotta go to school, you know? 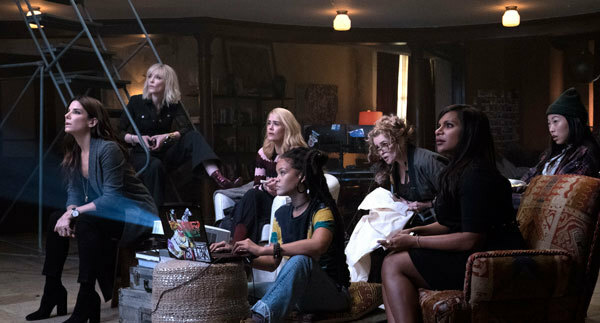 Mindy: I kind of thought what's fun about Sarah and Annie in this movie is that they're both so funny and I'm used to seeing you suffering on screen. It was great to see them do these comic turns. Q: These women are carrying out a crime but do you think just females working together is a good theme to put out there for young women? Mindy: Well, I mean, the fact that we're orchestrating a crime as opposed to fighting over a man is good. Cate: We had a director who wanted to make a story about women. 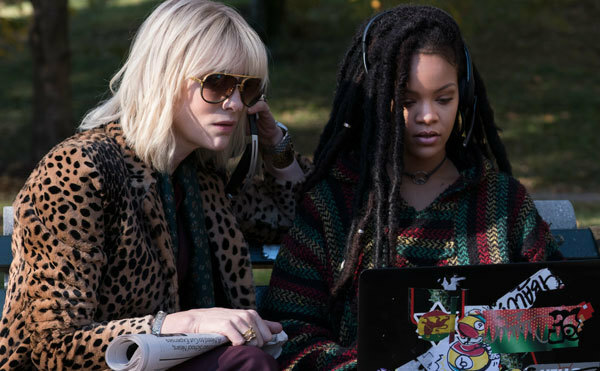 Everyone here wants to see more female directors and that absolutely has to happen. I've just come from Cannes, where there were 21 films and only three female directors and it puts an inordinate pressure on them. But here we have a director (Gary Ross) who really loves women and wanted to make a story where women could do their stuff. That's also fantastic. Anne: And you can't underestimate the power of visual representation. To an eight-year-old girl we're not trying to say, “Go have a life of crime”, but we're saying, “Go do what you want and there's space for you to do it with your friends, and there's room for all of you.” I think that films that have an "everybody in" mentality and that message for people who have historically been excluded is a good thing. Awkwafina: I think also when it comes to representation and diversity, the important thing about the characters in this movie is that (our race) is not defining our characters. I am a New Yorker from Queens. Asian-ness has nothing to do with it, and I think that's representation. That's where we're going. I think this movie is going to be a step toward a right direction in that case. 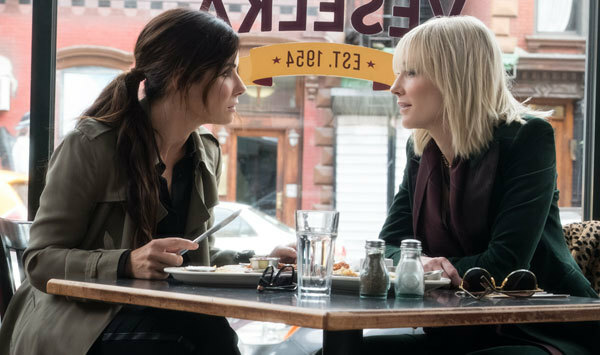 Sandra: Also, it's women taking care of each other, women being good to each other, women stepping back and letting the more gifted step forward in the heist; recognizing talent and saying, "Go out and shine. I've got your back." 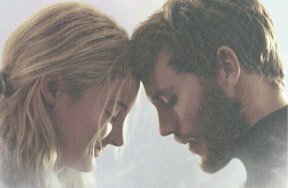 I didn't care about the heist as much as I cared about how they treated each other and how they lifted each other up. Q: Cool! 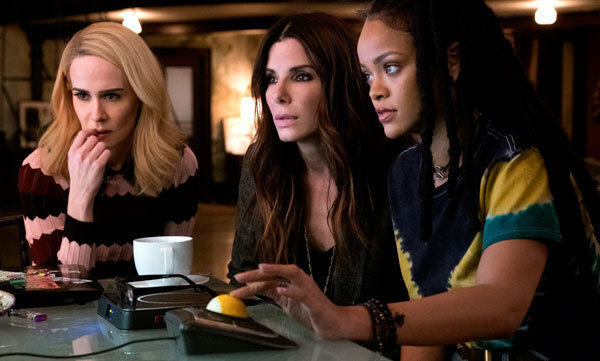 What was it like when the group of powerhouse women first got together to do the movie? Q: Many women, world-wide are all up in arms about abuse from men. Can you ladies say where you stand on that? Cate: I think unfortunately, it's a human issue really and it affects the men in our industry and change is good for them as much as it is for women. But I think it's really important that the media keeps the conversation moving forward. Unfortunately what should be a human issue has to remain political. I think it's fantastic that women all over the world are still keeping the conversation current. Sandra: We are a bunch of women up here saying we love being together, but none of us are saying we want to be up here without the men. Cate: Yeah, we just want a seat at the table. Q: Right! Lightning things up, can you talk about the glamour, the clothes, etc.? Cate: It's a huge shout-out to Sarah Edwards, the costume designer. 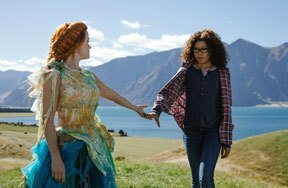 Another costume designer fell out at the eleventh hour and she had to costume all of us distinctively, and she literally worked 50 hours a day. Awkwafina: Right. It was that thing where every single morning, when anyone walked out of the trailer it's kind of like, "Oh my God!" I mean, I personally wanted to wear everything Cate was wearing. Awkwafina: Your Spanx, and Sandy had a great coat that I wanted. Sandra: All eight of us had very strong opinions about what's going on our bodies. The designers were incredibly collaborative. My dress was Alberto Ferretti but I wanted a sleeve a certain length because I was going to palm a jewel, but I wanted it to be black because my character needs to disappear. Once I got the dress and I saw the ornamentation on the bottom, I went, “Oh." It was a nautical theme. There were sand dollars and starfish and waves and I went, "Oh, Debbie Ocean. I get it." Cate: I mean, just because we're chicks it wasn't a fashion show. You want it to feel like the clothes are some that the characters would wear. If you're looking at the pedigree of these films, they have a panache. They do have a sense of style about them. That's part of the joy of it. Of course we ended up at the Met Ball, so there was fashion extraordinaire. Are you into heist adventure films? Are you glad the glam thieves are all women this time around? Lay down a comment below!